Even windier today but dry. Had 20 minutes in the pool but too gusty so swapped to pike gear and headed off up Cyanide Straight just below the second bend above the Mill. I use to fish this straight a lot, it once threw up a twenty, several doubles and some back up singles in a frenetic last day morning. 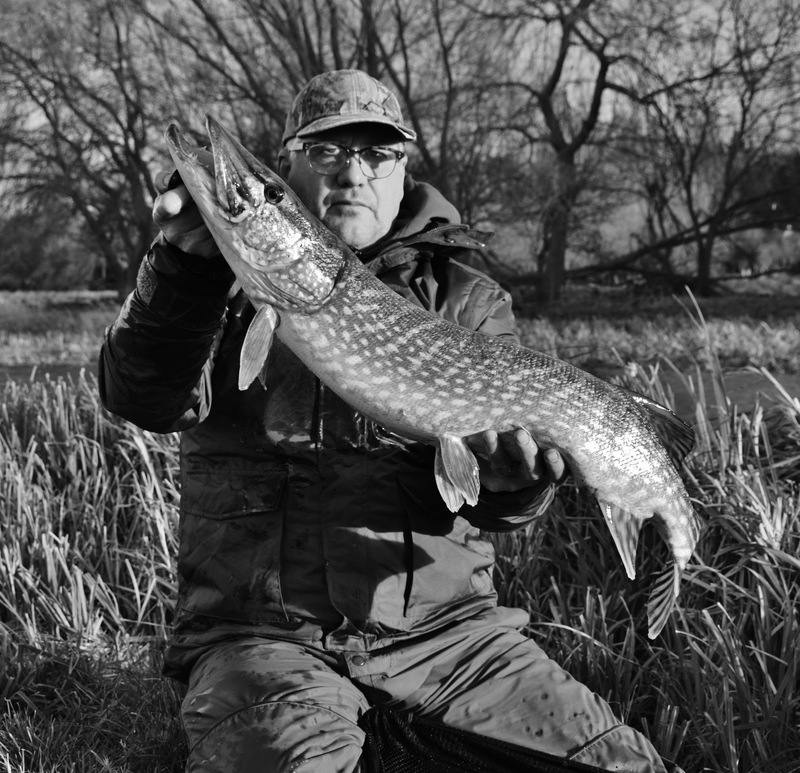 That was several years back and though I do fish it now takes seem far and few between and otter signs are frequent. Today though something made me stop at the big bend and set up to leapfrog down to the stile through some serious waves. I'd just got the middle rod in straight out in the main push when the buzzer and baitunner signalled a take. A decent fish powered down then back up into the push. I reached for the net which had snagged and as I pulled it one arm snapped just above the spreader. I managed to bodge it and got the fish in. 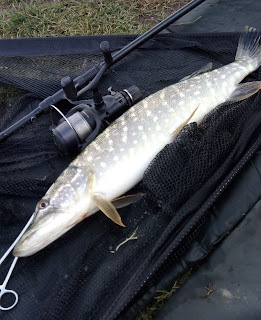 Always best to get a bait back out on the spot and within 2 minutes the smelt was away again but a lot smaller this time. Perhaps a consort for the one I'd just caught? An hour in and as I went to twitch a bait the float shot away and this one gave even more welly, staying unseen for over a minute The uneven net arms caused some grief before I'd got the fish over the net cord. Though my hooks were only just nicked in a trace with a big single had been left in the fish and this looked far worse than the earlier one. I applied some carp care having removed the trace which had stayed in due to a knot failure it seemed. I got the battered and torn mackerel back out there but perhaps it was too battered as when I went to retrieve it 20 minutes later it had come off. Solid pike. I'd take those any day.